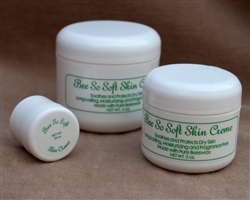 Home > Honey & Skin Care > Bee So Soft Skin Creme, 2 Oz. Net Wt. 2 oz net weight (we also have 0.25 oz and 4 oz available). This product works awesome to heal your cracked and dry hands, cuticles lips ! Great price & it goes a long way !